Or at least I felt that way at the Bovine last night for a packed show. 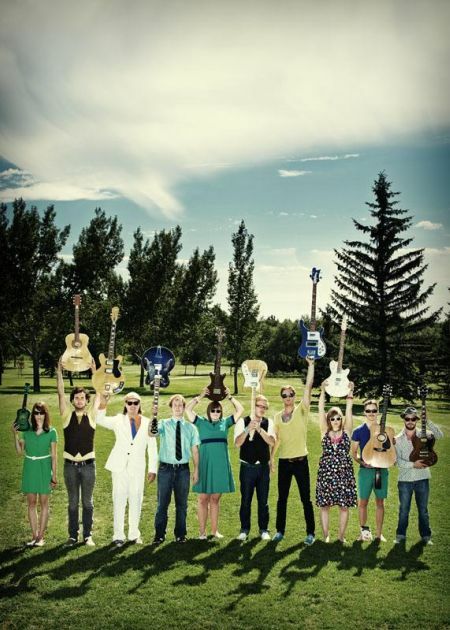 Seems as if everyone already knows about the 10-piece band Library Voices from Regina. Do that many people read Spin? This band has really done a lot in a short amount of time. The formed in the spring, recorded a 3 song demo, landed some good festival dates, opened for some names (Broken Social Scene, Weakerthans, Final Fantasy) and now have a six song EP (Hunting Ghosts & Other Collected Shorts) that will be self-released in the new year. Think tremolo soaked guitars with analog synths, handclaps, vintage organs, circuit bent electronics, some more handclaps, accordion, saxophone, handclaps and glockenspiel. The band is currently on the road across Canada in a 15 passenger van with a trailer…. Jesus. Expensive tour I bet. Heading East, check the myspace. Here’s the single Step Off The Map & Float. I guarantee you’ll get hooked by a clever lyric, a gang vocal, a handclap, or any combination of the three. Last night was also a decent showing and introduction to openers Provincial Parks. I look forward to hearing more of their stuff.